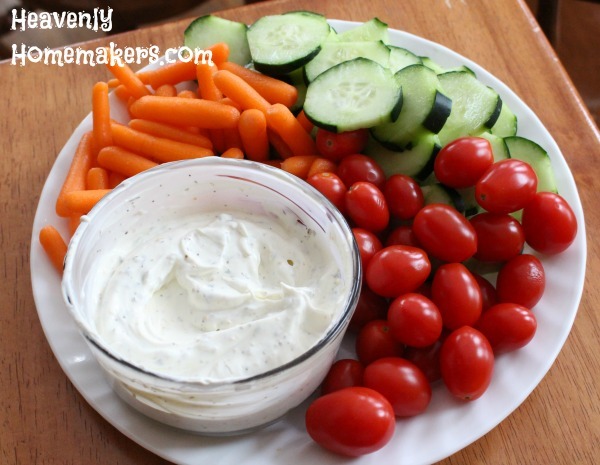 If you’re hoping to push the veggies, either for yourself or for your family, I think great dips are the way to go. Do not fear the dip! Unless they are full of ingredients like MSG or High Fructose Corn Syrup that hurt your insides. Otherwise, enjoy dipping your veggies in something fun and flavorful. I don’t know about you but I eat three times the carrots and cucumbers when I’m dipping them in hummus or some sort of creamy dip. Once on the way home from a basketball game with my family I was ravenous. We got out the hummus and carrots to munch on as we drove home. I ate a half pound of petite baby carrots before we made it out of the city. I ate so many carrots my jaw got sore from all the crunching. Veggie dip makes life better. It just does. 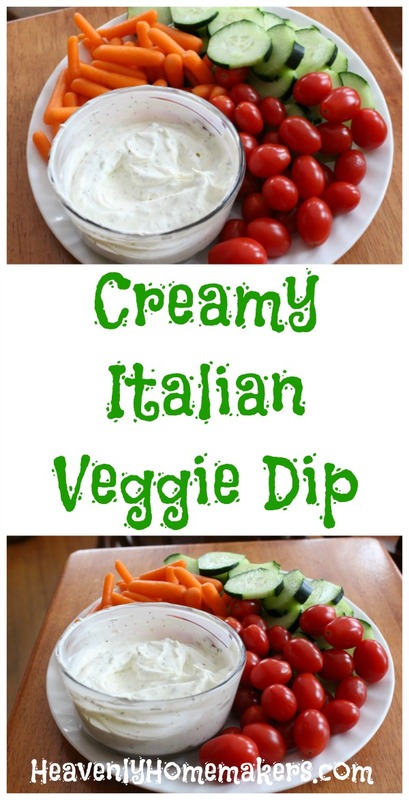 This Creamy Italian Veggie Dip is our newest addition to our veggie dip options in our fridge. 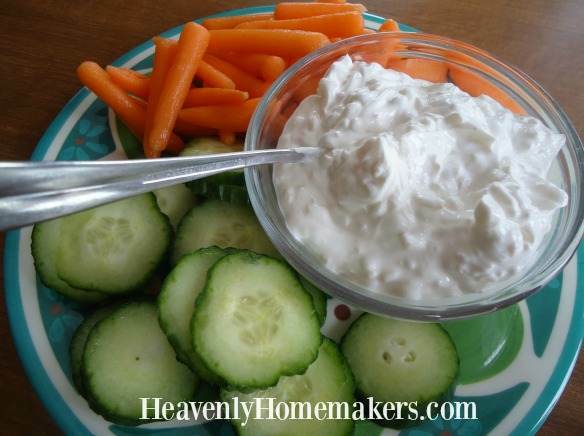 I love how easy it is to stir a batch of this dip together. Long live veggie dip! Cover and chill for at least one hour before serving. 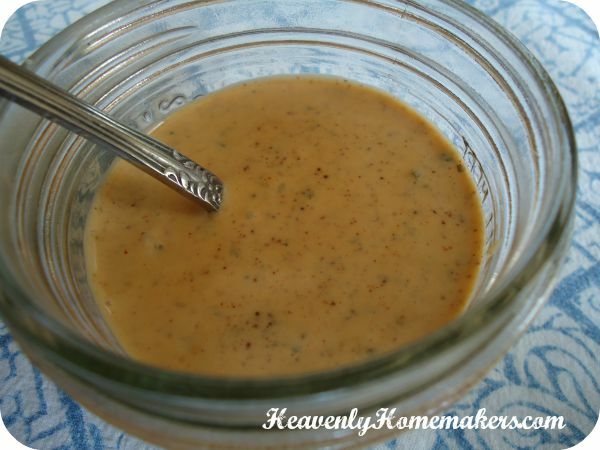 Find our recipe for Italian Dressing Mix here. 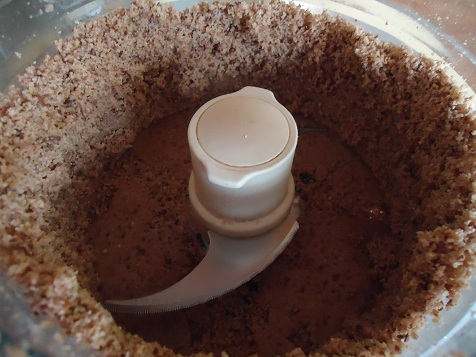 Save money by making your own taco seasoning mix. It is SO easy! And healthy! And you can put it in a jar (my favorite part)! Actually, even if you don’t have a jar obsession like I do, I recommend putting this mix in a jar as the flavors are strong and will absorb into a plastic container, or mingle with other items it may be sitting beside in your pantry. Put all ingredients into a jar and shake! Um, after you put a lid on…then shake. The jar. Shake the jar. With the lid securely on the jar. 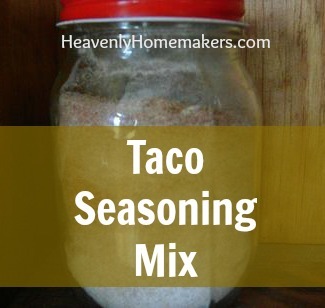 Three Tablespoons of Homemade Taco Seasoning Mix is equal to one 4-ounce package of taco seasoning mix. 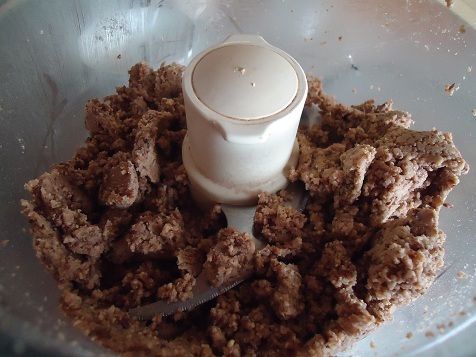 I would recommend adding 3 Tablespoons of mix to one pound of browned ground meat for tacos. 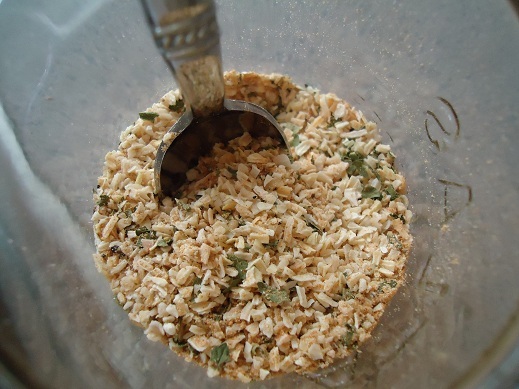 I would also recommend shaking again before each use to make sure the spices are well distributed throughout the mix. The jar. Shake the jar. You can shake all you want, but if you don’t shake the jar, your spices won’t be distributed evenly. Just wanted to be sure I made the instructions clear in regard to the shaking. Great. I can see it now. Husbands everywhere will walk into the kitchen and see their wives shaking (boogie down). As you can see, having this seasoning mix on hand is super helpful. Just grab it, shake it, and stir it into whatever you are cooking. Love it! After sharing the Ranch Dressing Mix recipe, several of you asked for different varieties of healthy salad dressing recipes. 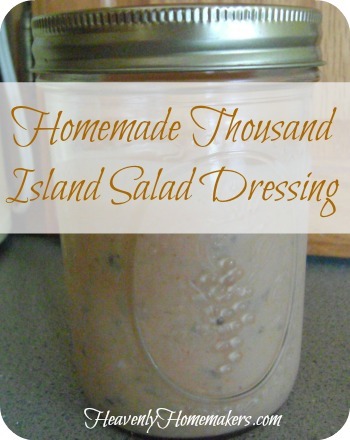 I’m excited to share my recipes for Italian Salad Dressing and Thousand Island Dressing! What makes these salad dressing recipes better? These use real food ingredients – choose to use healthy oils and other ingredients you feel good about feeding your family. I use olive oil for these. These save money – they cost much less than buying them pre-made! The price of Italian Dressing Mix can add up! 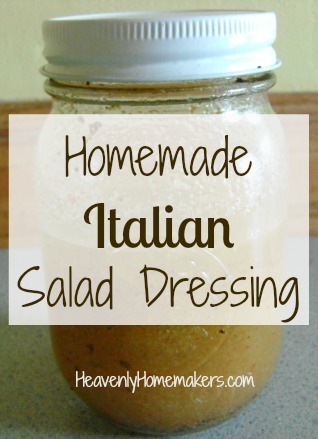 You can make Italian Dressing Mix ahead of time so all you have to do when you need dressing is mix it up! Shake ingredients together and store in a jar. To make Italian salad dressing: Mix 2 Tablespoons dry mix with ¼ cup vinegar (I prefer red wine vinegar), 2 teaspoons water and ½ cup olive oil. Use Italian Dressing to marinate chicken for the best grilled chicken!! Mix ingredients, cover and chill. So…what’s your favorite kind of salad dressing? 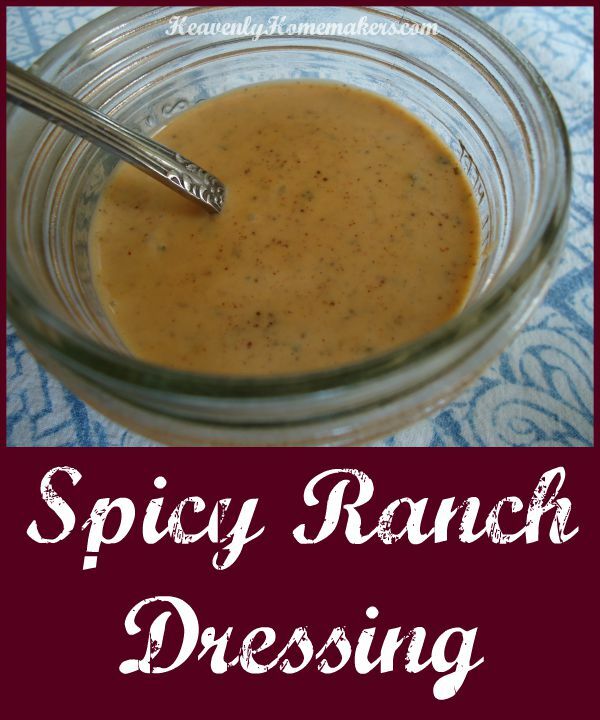 (mine’s ranch) Have I come up with enough healthier dressings (aka dressings with NO high fructose corn syrup or MSG) to tickle your fancy…or should I keep playing? I’m determined to come up with Caesar and Blue Cheese. But my attempts at these so far are not share worthy! Lookie what’s growing in my garden! Those cute little lettuce leaves will soon be cute big lettuce leaves. I can’t wait! I’ll be needing my homemade salad dressing before we know it. Wash and tear up a bunch of lettuce or spinach and put it in a bowl. Add whatever other raw veggies you have. If you’re feeling especially crazy, throw in some dried cranberries or raisins. If you want your salad to be your main dish, add some chicken, cheese and hard boiled egg. This is why I’m so excited about the above carnivals. However, I do have a fun idea for a salad dressing that I discovered one day when I was dinking around in the kitchen. Are you ready? It’s a novel idea. Orange juice. The juice from an orange. Fresh squeezed orange juicy goodness. It’s refreshingly simple. And yummy. And it contains no high fructose corn syrup or MSG. Now that I’ve shared that enlightening salad tid-bit, I’m very excited to share another healthy homemade salad dressing idea! 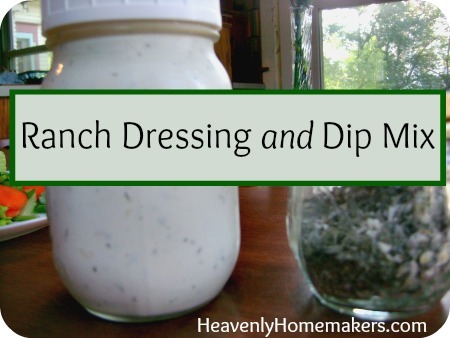 Rhonda sent me a wonderful Ranch Dressing Mix recipe!! I used to use Simply Organic brand because I trust it more than other brands. But now, thanks to Rhonda, I can make a super healthy (and much, much less expensive) Ranch Dressing any time I need to! I use Hain Safflower mayo and Homemade Buttermilk. The jar on the right is the mix, which costs pennies compared to a packaged mix! The jar on the left is the ranch dressing all made up and ready to go on our salad. Rhonda even suggested using this ranch dressing mix in my Ranch Potato Wedges recipe. It works GREAT! I shall never buy another ranch dressing packet again. Rhonda – you rock! Save money and use real food ingredients when you make Onion Soup Mix! 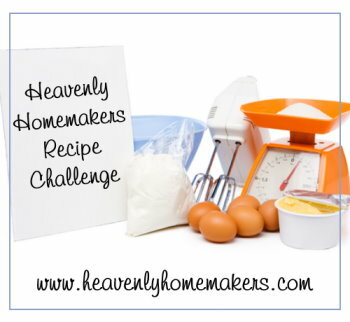 This new recipe in The Challenge was super easy to put together! 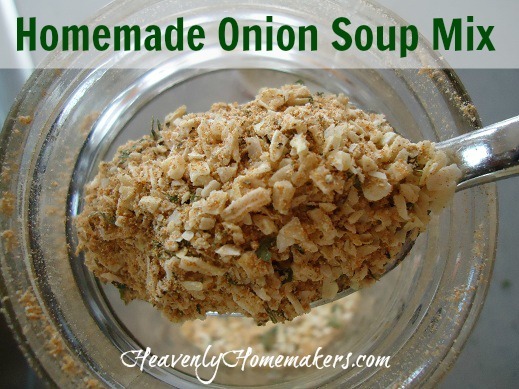 Vicki, one of our readers, sent me an Onion Soup Mix recipe to try and WOW is it simple! I tweaked it a teeny tiny bit, but really, this recipe is more Vicki’s than mine. What I love about this recipe is that I didn’t have to look high and low for the ingredients. Many onion soup recipes I found call for some sort of bouillon. Almost always, bouillon has MSG. There are MSG free bouillon varieties out there, but what if they aren’t easily accessible to you? And so…I was very happy to see this recipe that contained just dried herbs and spices! Mix all ingredients in a jar, then give the jar a good shake. I'd recommend shaking the jar to mix the ingredients well before each use. I used the Onion Soup Mix in this simple, one dish stew and YUM! 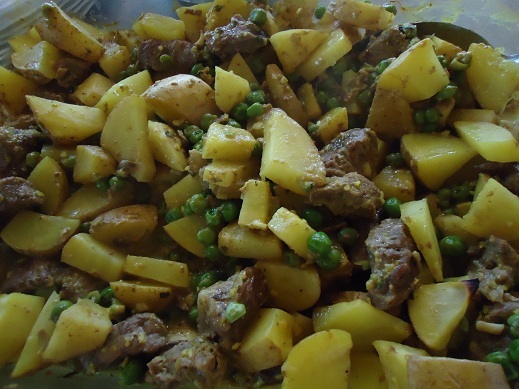 Find the recipe for Simple One Dish Meat and Potato Meal here. SO many of you requested this recipe that I’m guessing you all must have tons of wonderful ways of using Onion Soup Mix? I would LOVE for you to share what you do with this mix!!! I have exactly two recipes that call for Onion Soup Mix. I’m so excited to use this mix in those recipes because I’ve not made them for years. But what else??? What do you make with Onion Soup Mix?? It all began at Asa’s graduation party with two other graduates last May. The moms and I planned it together and they decided to go all out. One of the items on our menu was “crusty bread with different topping options” like meats, cheeses, and nutella (though probably not all at the same time). 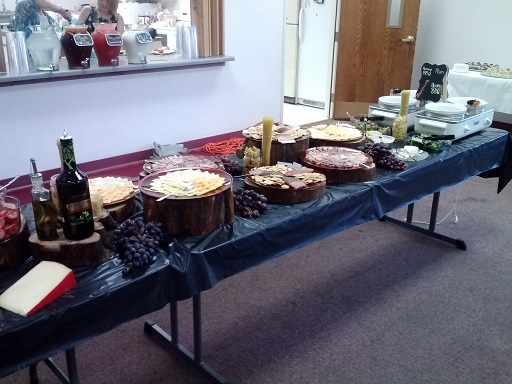 My friends and I set out a lovely buffet. I was the one in charge of purchasing the condiments, sauces, and Nutella. Not knowing how many hundreds of people might show up and how many of those hundreds would want to spread Nutella on their bread – I bought four enormous containers of it. We went through exactly 1.5 of those huge tubs, so guess what we’ve been eating since May? My boys have been so sad about this. We finally finished them off, and now the boys are having Nutella withdrawals. I can’t stand to buy more, so I determined to figure out a healthier option that I can feel better about. Some of you might remember that I attempted Homemade Nutella a few years ago. That was tasty, though still had quite a bit of sugar. I had a terrible time actually finding Hazelnuts this go around – but part of my problem was that the price was throwing me off. 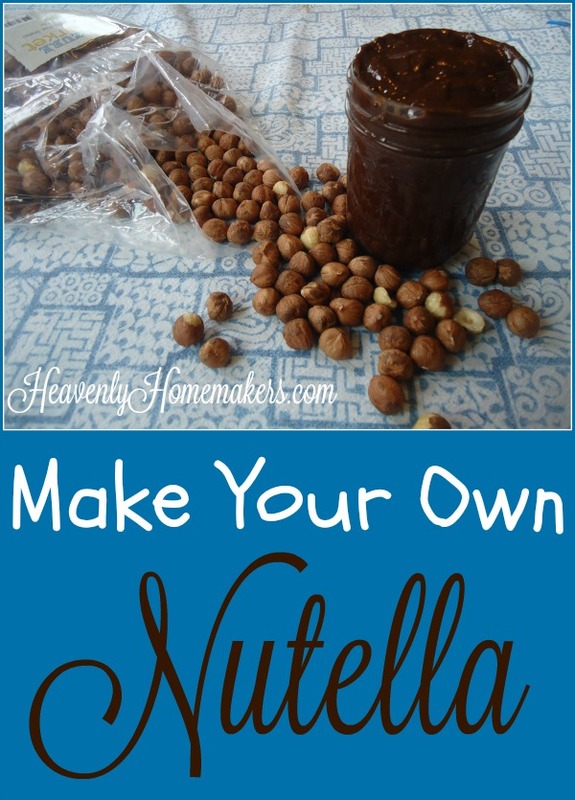 The good news is (now that I’ve attempted this recipe and learned a few tricks) – it takes only a few hazelnuts to make a batch of nutella. So my purchase will go a long way to providing a healthier nutella option for the fam. I’m excited that this version of Homemade Nutella is lower in sugar than most. If you prefer, use expeller pressed coconut oil since it is flavorless and won’t effect the taste. Lay the hazelnuts on a cookie sheet and toast them in a 350° oven for about 10 minutes. 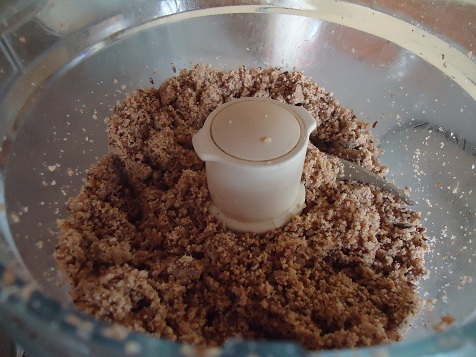 Whirl toasted hazelnuts in a food processor until smooth. 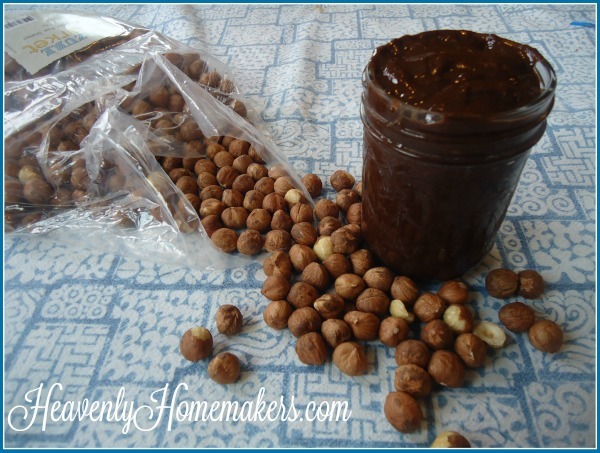 Store in a half-pint jar for up to three weeks. Have you tried making Nutella before? I’m getting ready to write this recipe for you, but suddenly I’m in a panic because I don’t know what makes French Onion Dip French. I get my onions from America and I don’t do anything Frenchy to them. Am I somehow supposed to Frenchify my onions? If so, what does that look like? My once super simple recipe has now become completely stressful. I therefore decided to do some research on the matter since I have plenty of time to waste, but mostly because I don’t want to steer you wrong with a recipe. 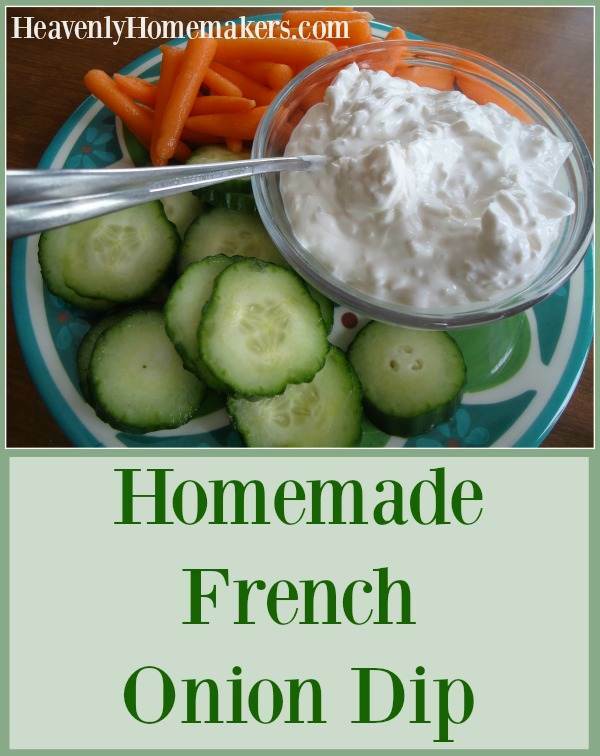 The first thing I came across online was a packet of Simple Organics French Onion Dip. Its tagline? “America’s Most Popular Dip.” Well that clears all the questions right up. What?? Well, we it appears that in our quest to discover the origin of this dip, we can conclude that this dip is not French at all. The dip has nothing to do with France or French people or French food. French Onion Dip is a made up name, just because it sounded good for marketing purposes. In defense of Lipton, I would concur that French Onion Dip is a better sounding title than White Onion Dip or the obvious, Just Onion Dip. The name French Onion Dip sounds more fun and fancy. Either that or I’ve gotten sucked into the marketing ploy. Now that we’ve cleared that up, we can move on with life and learn the recipe. Chill for at least two hours before serving (or serve right away because who actually follows that instruction?). Serve with fresh veggies or potato chips. You can’t really mess up this recipe, so don’t worry about measuring exactly. Life’s too short to use (and wash) measuring spoons. Feel free to add a touch of garlic powder or black pepper. And about the potato chips mentioned in the recipe? I find the kind with the fewest ingredients and the healthiest oil (usually safflower) and go with it. 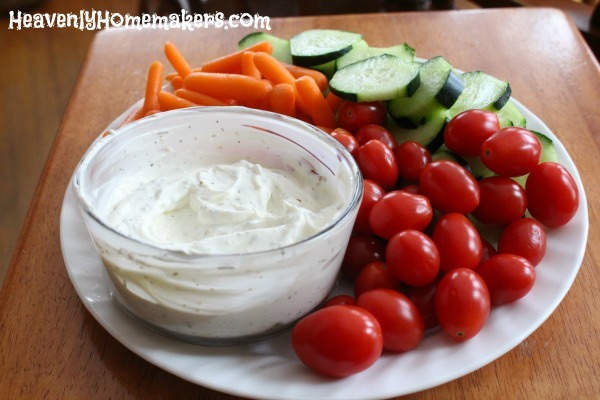 Potato chips with this dip make a great party food. It goes without saying that the next item on my agenda was to see why fries are French, or if in fact they actually are at all. Low and behold, fries originated in the U.S. but were called French because they were “served in the French manner.” Huh. Are you doing something fun for New Year’s Eve? I’ll probably make this dip. Then we can sit around with our friends and talk about the origin of food and where different foods got their names. I’ll be the life of the party. Almond Butter recipe? Yeah, I’ve got an Almond Butter recipe. I think. On Monday, I decided to try making a new variety of No-Bake Cookie Bites. I was out of Almond Butter, so I considered that it was probably as easy to make as Peanut Butter, which I make all the time. Heading to my computer to search for how to do it, I realized: I think I have done this before and maybe even already have a post written about it. So I searched my own website. Sure enough. 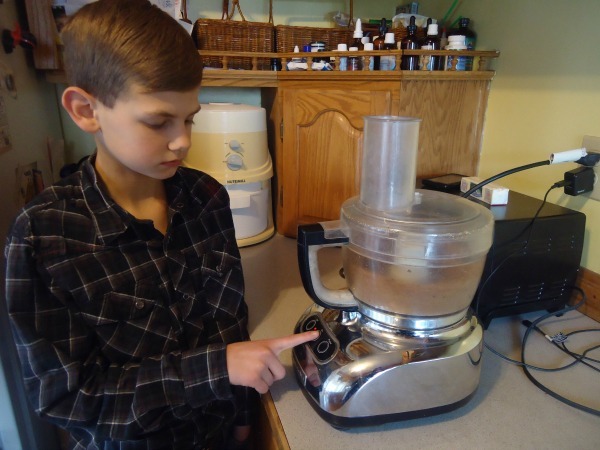 I told us all how to make Almond Butter back in 2012. This makes me wonder what else I’ve already taught us how to do that I don’t even remember. Maybe I’ve told us all how to save thousands of dollars or how to save hours of time. What else have I forgotten?!? Well anyway. I am loving the No-Bake Cookie Bites so much that I will be actually using homemade Almond Butter more often, which will likely help me remember that I know how to make it. In case you also forgot that I have already taught us how to make this easy spread, I am re-posting the tutorial for us all here today. May we all remember and use these instructions often. May our brains be for us instead of against us. May we never forget when we walk into a room, what in the world we walked in to get. 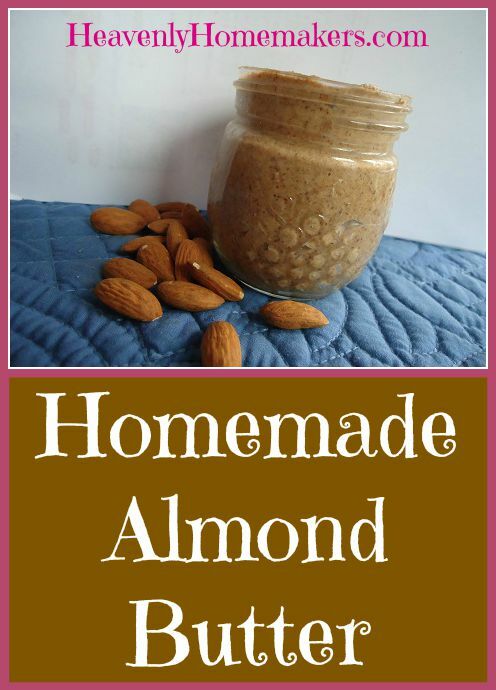 Here’s How to Make Almond Butter! Step One: Pour 2 cups of almonds into a food processor. I have found that 2 cups of almonds creates one full cup of almond butter. I don’t recommend putting more than 2 cups of almonds into your food processor at one time. The process takes a while, and the more almonds you have, the longer it will take. Step Two: Place lid on food processor and turn it on. Plugging it in is always a plus as well. This will be very loud at first, so warn your household. Step Three: After processing almonds for two to three minutes, use a spoon to scrape down the sides of your food processor and shift around the almonds. Step 4: Continue to process, but stop and scrape and stir almonds around from time to time to aid in the butter making process. And there you go – lovely, smooth and creamy almond butter. What other nut butters have you made? Did you remember that I’ve already told us all how to make this three years ago? I sure hope your brain works better than mine. P.S. I order organic almonds from Braga Farms. They are a wonderful company to work with and offer high quality nuts. 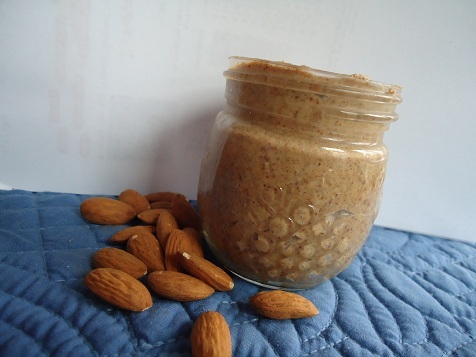 Almond Butter will stay fresh in the refrigerator for several weeks.